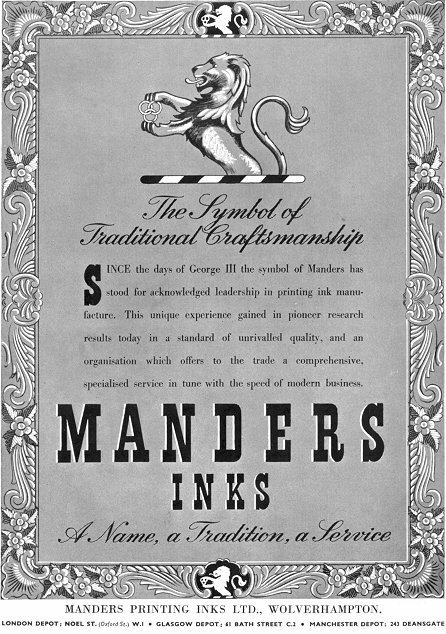 As further testifying to the remarkably strong position attained by the house of Mander-not merely in respect to varnishes, colours and paints, in all of which directions its output is of huge proportions, but more particularly in the printing ink section and its essentials in respect to colour, varnish and so on-have we pleasure in placing on record some impressions of the establishment gleaned during a visit early in November last. The headquarters and chief works are situated round and about St. Johns Street, Wolverhampton, but out at Wednesfield, some two or three miles away, is situated a further large establishment, in itself much larger than most factories associated with the allied industries. To refresh our memories in respect to colour, we look in at the Town Well and School Street Works paying special attention to the department 'devoted to colour making. These show open, single-story rooms with gallery, enormous vats at one end, and a long row of huge tanks of colourful length of the floor. After filtering, tramlines bear the trucks carrying the colour into steam-heated or vacuum chambers. The lighter colours, the deeper lakes, and the darker shades are confined to their respective departments, and it is very interesting to note how, after mixing, the development of colours is succeeded by unnumbered washings of pure water, whilst from beginning to end is felt the control exercised by the laboratory. The chemists' department seems to us to be one of the most striking features of these works. It controls test by test, all supplies of goods coming into the works, all results obtained at the various stages of manufacture, warrants the sale of the finished article, whilst, above and beyond this, it is constantly at work on new colours, colour combinations, new methods of treating colours and oils, of suiting inks to papers. The permanency of colour seems to be an ever present aim, and, walking out on to the flat roof facing the laboratory windows, we notice many slips of paper attached to the windows, all bearing colours under test in some degree for permanence in connection with atmospheric effects. Some of the slips are dated nine and twelve months ago. On the outskirts of Wednesfield a seven-acre piece of land, bordered by canal on one side and railway on the other, easily reached also by the electrical tramway, is the property of Messrs. Mander Bros., and a very considerable area of ground is covered by various specially-erected buildings. We find that since our visit of some years ago the buildings have been entirely re-modelled and large new departments added. The firm is in the enviable position of possessing ample accommodation to carry out its own ideas in respect to the most desirable arrangement of works, and we are to find that the aims and ideas of experts have been actually carried out here. The premises are regarded as the ideal of their class. The main buildings run along the water-side, with others at right angles. The first are devoted to colour mixing and to ink making, in fact, forming an ink making plant complete; the other series of buildings nearer the railway is allotted to varnish manufacture, also complete. These works are, we understand, chiefly used for supplying the materials made up at the Wolverhampton departments. A tree-bordered main road sweeps round two sides of the works area, and affords access for vans to all parts. Each of the buildings is allowed ample space round about, and the structures, more particularly the new ink works, are most substantially built, with stone staircases, concrete floors, and fireproof generally. The electric light is used throughout, and, as at the Wolverhampton works, a marvellous degree of cleanliness and tidiness prevails, for although all departments are evidently very busy, untidiness is never apparent, and many a printing office with far less excuse for the appearance of its rooms might take a lesson from the ink maker. 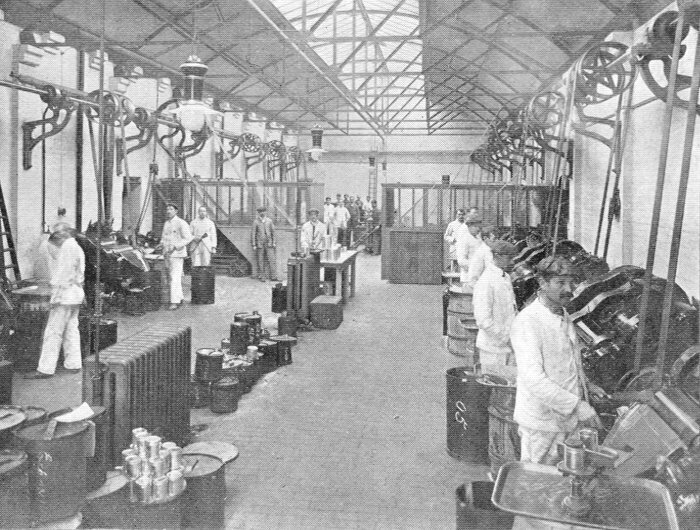 The general scheme with regard to these works seems to be the elimination of dry colour from the grinding rooms, realizing that dust floating in the air and being deposited on grinding rollers may seriously neutralize the efforts to provide thoroughly pure and finely-ground colour. Thus a long room is devoted entirely to ink grinding, a heavy door shutting off the ink-mixing department with its closed-up machinery. Printers will appreciate this point. A low screen across the centre with the driving motors to left and right divides the floor area. Around and against the walls, with ample space about, is arranged a continuous series of large three-cylindered ink-grinding machines, a battery of some five-and-twenty of large size being already in full operation. 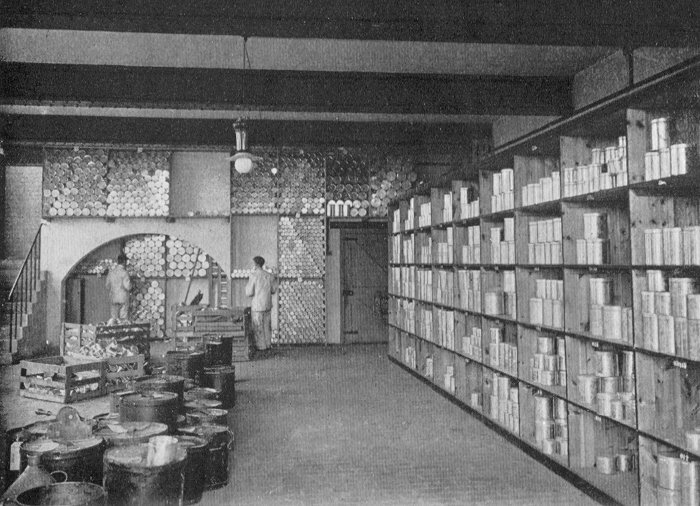 The Can and Drum Store. It is interesting to go from machine to machine and to note well-known colours in soft, oily curves rolling away from the pressure of the cylinders, the white coated operators, each with his magic broad-bladed knife charming or threatening-whichever you like his machine into uniform pressure and even flow. Well-known blacks, blues, and greens in one section are shown as on regular order for well-known magazines, whilst other colours are equally popular for illustrated work. The facility for handling cans, for frequent tests and arrangement generally, speak of an ideal system. Driving is obtained by short belts driven from overhead shaft on either side of the room, power being supplied by a couple of 50h.p. motors. Contrasted with the roar and roll of so many grinding machines, the mixing department alongside is positively restful. Judging by the piping which comes from the ceiling the tall mixing machines are fed from above, and we find this to be the case, varnish and dry colours being fed through their respective channels. This further explains the entire absence of dust, that is dry colour, in the air. The mixers are mechanically operated, the cleverly arranged blades of the paddle mixers making short work of the compounds of oil and colour. 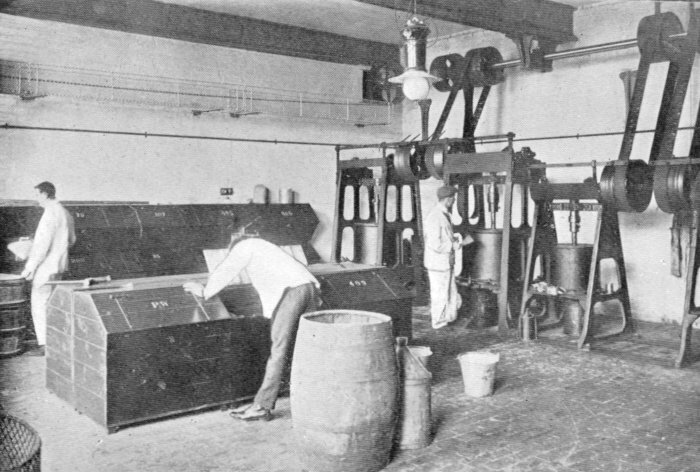 Besides the series of large sizes there are smaller cylindrical mixers, and we note particularly the curious looking litho blacks in their steam-heated pans. This department is devoted to blacks. In the next building across the yard is a department much more pictorial in effect. Again carrying out the idea of freedom from dry colour or dust, this room is fitted down one side and the centre with a series of bins with closely fitting lids. In these bins dry colours are stored, and the effect is to keep one colour to itself when the supply is being drawn upon, for, of course, neighbouring stocks would not be opened at one and the same time. Along the further side of the wall is a series of mixers, and we find these to embody some very ingenious ideas in apparatus for mixing. There are small-sized circular mixers ready to tackle small quantities of special colour fitted with scientifically arranged knives which scrape the sides, vessel and knives being revolved separately. 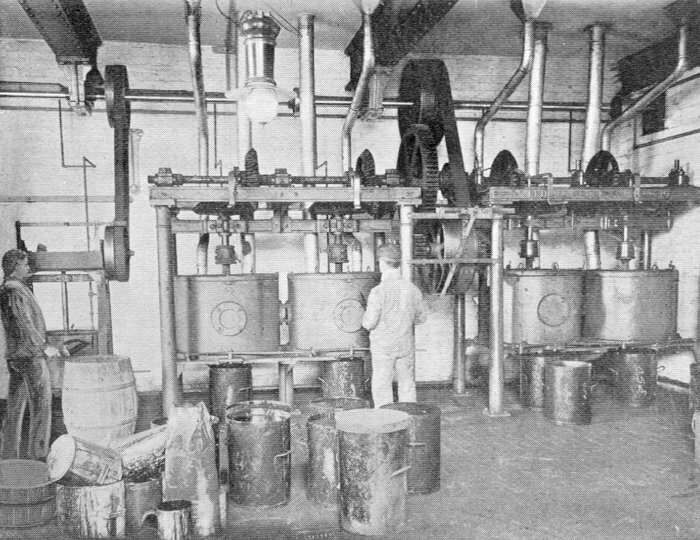 To complete this as a mixing department, on a third side is a row of varnish tanks holding the pale, transparent varnish used for mixing colour. This department, as with the others, is self-contained, and possesses its own motor for driving purposes. Stepping now into a large roomy building, shelved from floor to ceiling along the walls, and with tables and benches, we find a can and drum store. The familiar tins in a variety of sizes are arranged in their respective sections, and all readily accessible. This is not a tin store, but an ink warehouse, and in spite of the chief chemist's confidence as to the absolute uniformity of new inks and those made for some time, it is quite clear that he makes no mistake as to keeping up substantial stocks of all colours. This we are glad to see, for we know only too well how commercial conditions so frequently require the printer to order inks for immediate use. Here once again we have the assurance that the laboratory maintains rigid fulfilment to standards, so that absolute reliance may be placed on receiving the same colour at any time of ordering. The floor above is used as a storeroom for important sundries such as pomade and ink-easers. A steam-heated pan for solidifying oil is also noticed, the odour of the place being rather pleasant than otherwise. On looking out from the crane platform at the far end a fine view of the edge-bordered fields is obtained, for we are really on the fringe of the country here, with all the real country advantages of fresh air and spaciousness generally. An adjacent room, the dry black room, is situated directly over the black mixers, to which earlier reference is made. The whitewashed walls are rapidly assuming the artistic mottled effect of a busy chimneysweep's countenance through contact with the piled-up sacks of carbon blacks lodged here. The receptacles over the mixing cylinders are filled from here, and again there is every facility for minimizing any waste and preventing dust and trouble resulting there from. The isolation of blocks of buildings is carried out with a thoroughness which must be the envy of those confined within small and often cramped areas. To reach the place of storage where the casks of colour, tins, and supplies of this character are safely put out of the way, and yet easy of access, we cross the yard again and enter a long single story building filled with casks and crates, tins and drums. In totally distinct buildings, separated by considerable yard space, is carried on the operations concerned with varnish making. First to the actual cooking. Without referring to the varnish works in detail, as this department represents rather a re-organized section than a new works, we may refer to some impressions gained whilst witnessing the various operations of manufacture. 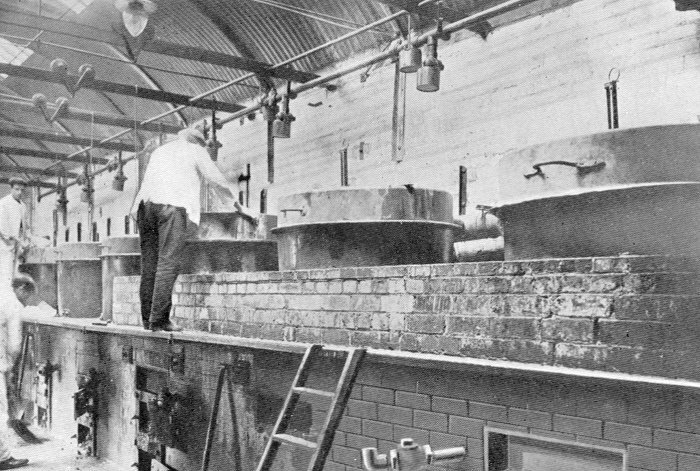 The varnish-boiling works show a long row of pans set in brick with closed fires. A large cowl or hood is fitted to each to carry off fumes, and conspicuously placed thermometers record temperatures. From the 'British Printer', November 1939. Conscientiously climbing the steps to sniff at the odours each successive one surely more pungent than its predecessor we are able to note the great heat used, and to observe the working generally, returning with an enhanced impression of the infinite care taken to prepare varnish. At the rear of this building is one of similar size, the tubing whence escapes the fumes from the pans being here in evidence, and we are shown a clever device automatically coming into operation at each pan in case of fire from any individual boiler. Following the varnish as it runs off in pipes across the yard to the oil stores, we find on the second floor of a substantial building several dozen thousand gallon tanks, each equipped with gauge for showing depth of varnish contained in the tall cylinders, and with pump for filling or removal of the contents. Large as would appear to be this stock, as we are aware from visits to varnish stores, this represents but a fraction of the tremendous amount of oil always maturing in the firm's stores. The various buildings are disconnected, partly for convenience for manufacturing purposes and largely to minimise the risk of and the scope of damage by fire. Expecting to find full provision made to meet emergencies, for the fire fiend is ever a possible foe where oils are being treated, we found that every possible safeguard was adopted and each section provided with appliances for fighting that which is a good servant but a bad master. The works also possess their own fire brigade-already tried once on their own area and again at a neighbouring concern. Whilst we were present an alarm was raised and instantly men swarmed out of the buildings, each to his allotted task seizing section after section of hose pipe, bucket, or "stood by" hydrants exactly where duty required, and all with a celerity which it would be difficult to surpass. would appear decidedly popular with the workpeople, and so healthy as to form quite a sanatorium for those employed at headquarters. Leaving the works we are struck by the appearance of a fine new building, an attractively built school in style, with a handsome villa attached. Inquiry as to this led to the production of keys, the opening of doors, and we found the building to be a messroom for the workpeople. The floor is coated with a special linoleum-like terracotta coloured concrete, warm and clean in appearance. The tables and seats are painted a pleasant green and with the large cloakroom and lavatory make up an eminently neat and attractive picture. We come away with the impression that "this is surely Mander-like" - well thought out, well carried out, sound in conception, finished in every detail. No wonder the house maintains its place in the confidence of friends and customers.